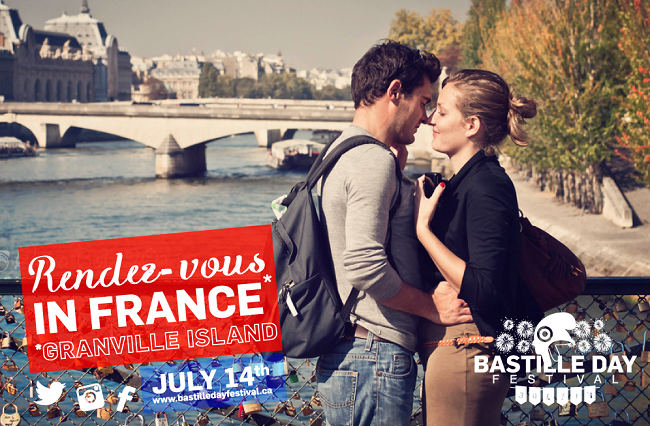 Celebrate one of France’s most beloved holidays with the Bastille Day celebrations at the Granville Island Market. Taking place July 14 from 4 p.m. to 1 a.m., the the event celebrates Bastille Day, one of the biggest observances in France. Bastille Day marks the beginning of the French Revolution, and the storming of the Bastille in 1789. Celebrations take place annually all over the world, and this year will mark the first of such events in Vancouver. The French Consulate and the Alliance Française have decided to come together this year, offering Vancouverites and tourists a firsthand look at French culture and tradition. The Public Market Courtyard will decorated in blue, white, and red and transformed into a typical French neighborhood. There will be a French picnic, traditional waiters’ race, photo booth to recreate the Parisian dream, French music concerts, a French dog contest, mime performances, face painting, French storytelling and arts activities. Visitors will get to go home with souveiners of the day like French bérets and t-shirts, and enter into two raffles to for a chance to win a flight to France with Air France, or a 4-course dinner for 6 guests at the Fairmont Pacific Rim. When: July 14, 4 p.m. to 1 a.m.